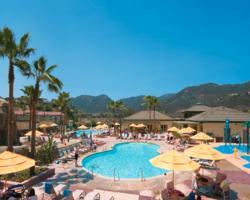 Welk Resorts Mountain Villas Resort resales, save 50% or more, golf vacations, timeshare resales. FIRST RIGHT OF REFUSAL? DOES IT EXIST? PLEASE NOTE THAT IF YOU OWN AN EVEN OR ODD YEAR PACKAGE YOU CAN ALWAYS BORROW FROM THE YEAR AHEAD. YOU CAN ALSO ROLL YOUR POINTS OVER TO THE NEXT YEAR SO AN EVEN/ODD PACKAGE CAN BE USED OVER A TWO YEAR PERIOD. DEPOSITS IN INTERVAL ARE GOOD FOR A TWO YEAR PERIOD AND CAN EVEN BE EXTENDED BEYOND THAT FOR A FEE. YOU ARE GUARANTEED THAT TITLE IS CLEAR AND EVERYTHING IS CURRENT! CLOSING COSTS ARE $395 PLUS RESORT TRANSFER FEE OF $295. AS SOON AS WE GET IT. THESE SELL REALLY FAST! BUYERS LET US KNOW WHAT YOU WANT AND WE WILL PUT YOU ON OUR WAITING LIST. CALL US OR EMAIL US WITH YOUR WANTS! Nestled in the foothills of North San Diego, just a short drive from world-famous attractions and sunny beaches, Welk Resorts San Diego offers a panoramic 640-acre vacation playground with dozens of family-friendly activities right on-site. The newest of all of the Welk villa communities, Mountain Villas offers beautiful cabin-style villas set high up on the mountainside, with spectacular views of the sprawling fairways and natural open spaces for which Welk Resorts San Diego are renowned in Southern California.